We are Solaronix, a Swiss company founded in 1993 serving a worldwide customer base with our end-to-end expertise in photovoltaics, from materials production to solar panels and testing equipment manufacturing. Solaronix is a Swiss company founded in 1993 by the twin brothers Andreas & Toby Meyer. The headquarters are located in Aubonne, facing lake Geneva and the Alps. This beautiful and natural landscape has always been an inspiration for clean and renewable energy sources. The origins of the company belong to the pioneering discovery of a new generation of solar cells at the Swiss Federal Institute of Technology in Lausanne (EPFL). This scientific breakthrough enabled the feasibility of innovative photovoltaic devices with unparalleled features. 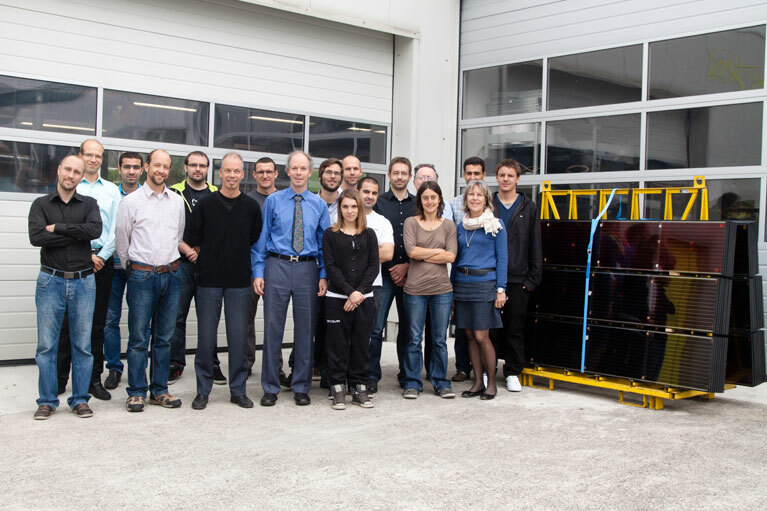 Solaronix was the first startup company to acquire a license for the Dye Solar Cell technology from EPFL in 1994, with the aim to bring this invention to an industrial level. To do so, Solaronix' high-end scientific and technological expertise is divided into three activities: Materials, Solar Cells, and Equipment. The Materials division is devoted to the production and distribution of the materials for Hybrid Solar Cell and Dye Solar Cell fabrication. Solaronix delivers retail quantities and bulk supplies of specialty chemicals and components to the various research centers, academic laboratories, and pioneering enterprises working on next generation photovoltaic technologies around the world. The Solar Cells department takes advantage of the materials produced in-house to develop Dye Solar Cells and the related production processes. The pilot line installed on the premises is able to produce entire series of solar panel prototypes for case studies and demonstrative realizations. In 2013, Solaronix realized the world's first multicolored Dye Solar Cell facade installed on the EPFL congress center. The Equipment business unit is focussed on the conception and fabrication of solar testing apparatuses. They rely on a genuine light source, developed in-house, which is able to perfectly mimic sunlight. This acclaimed and exclusive solar simulation system allows Solaronix to supply leading photovoltaic players with accurate and dependable solar testing equipment in either standards models or customer-adapted realizations. Thanks to these three complementary domains of expertise – components, solar cells, and solar simulators – Solaronix has a leading position to provide the photovoltaic industry with innovative solutions. Should you like to learn more about our activities, please browse the website or send us your inquiry through the contact page.